Cherry Tobacco comes from the Diamond Cosmetics Winter 2009 collection. It is a blackened red polish that looks really dark in indoor light. When you get a direct hit of light you can really see the dark red shimmer throughout. I've seen other pictures of this polish and I thought I'd love it. Don't get me wrong, I like the color, but I'm not completely blown away. On the bright side, it only needed 2 coats for full coverage, and the polishes are only $2 apiece on their website! What a nice red creme from Zoya! This one is definitely different than all the other reds I have in my collection. It looks like it has a little orange in it, but it is not too overpowering. Application was just great like all Zoya polishes and only needed 2 coats. Despite not having a great variety of colors, Ulta seems to have some really nice polishes. Vintage Violet is light purple creme with lots of pink undertones. Application was flawless and only needed 2 coats to be opaque. I received the rest of my Rescue Beauty Supply polishes today! I plan on posting those really soon! I usually have good luck with Zoya polishes and this one is no exception. Sloane is a very dark and vampy reddish purple microshimmer. It was very pigmented and only needed 2 coats to be opaque. In indoor light this one almost appears black, but if you move your hand around you can definitely see the shimmer and color. Application was pretty good as usual. On another note, I am back in TN (therefore, with internet service) so I will be able to answer the e-mails I have accumulated over the past week or so. I am so sick of driving though! Traffic in DC was horrible! These were my first polishes from Goldie and I am very impressed. I bought these in a 3 pack from Marshalls for around $3-4 total. It is a brown (almost a burgundy) color with gold shimmer throughout. I was shocked at how well these applied. I only needed two coats and it is completely opaque. And the bottle design? So cute! The only part about it I didn't like was that the cap was a flimsy plastic piece. Overall, you should definitely check out Marshalls to see if they have any more of these. I found Deck the Halls during the Ulta 5 for $5 sale. So yes, I got this one for $1! While not completely original, it is a really nice, bright red jelly. I've had really good luck with application on these polishes. They applied just fine for me! The handle is slightly on the short side, but didn't really hinder the application. How beautiful is this polish?! The red and gold glitter! The red jelly base! I really don't have to say much about this one, the picture speaks for itself. Application was flawless. I hope everyone is having a safe and happy holiday season! Cherish comes from the Spring 2009 Romantique Collection from China Glaze. This collection has a unique finish to it. It sort of looks frosty and metallic at the same time. This is a light green color that is sort of hard to describe. It is not an "in your face" green by any means. You really need to be careful when applying this one since you can easily see brush strokes. This one was definitely just ok to me, but it is a great polish to use for Konading. Las Vegas is a dark green glitter from NYX. This polish doesn't seem to get much press, but it is absolutely gorgeous! Application and formula on it was just fine. I ended up buying this one from Cherryculture (I've had only good experiences with this company). Nothing says the holidays like silver and glitter! Magic Attraction is a chunky holo polish from the Color Club Vixen Collection. I love the shimmer on this one! Even though it has a clear basecoat, it covers pretty well with 3 coats. Application on this one was just fine. I love it! Sultry comes from the Color Club Glitter Vixen Collection that I found at Ross. This one is very holiday appropriate and is a bright chunky gold polish. I believe it has a clear base to it, but it is so dense that it only needs 3 coats to be opaque. This isn't a complex color, but boy is it glittery! Yay, it's my first Illamasqua polish! It is a British company, but you can buy some of their items online on the Sephora website. Yes, they are expensive (my only justification for getting this is that I had my Sephora giftcard and free shipping), but they look and had a perfect formula! Muse is a great teal color and barely needed 2 coats to be opaque. The downside? I looked on the ingredients and they have formaldehyde resin in it :-( Also, as you can see from the bottle, they have a large black top. You have to pull the top off and there is a small part that is attached to the brush. It was so short that it was sort of hard to apply. Overall, the positives outweigh the negatives on this one! Sorry guys, I thought I had another day of BB Couture, but I can't seem to find the picture. I hope you don't mind a Sephora polish. I know, I know, the last time I reviewed them I thought it was overpriced for the size, but with the Sephora $15 giftcard I thought why not? Raisin is not the most original color, and I'm not sure why it is called Raisin, but it applied so well. I could do without the short brush, but the mini pro-wide brush would probably help those of you with skinny nail beds (and OPI brush is too wide for). It is a really nice pink creme with hints of purple. Pale Poppy is the lighter version of Poppy Passion I showed a few days ago. It is a bright coral creme that is a favorite of mine. Application was a dream and needed 3 coats to be opaque. I will be going out of town this holiday season. I'm not 100% sure of the internet access there, so I may not be able to check my e-mail while gone. I will, however, do my best to continue posting photos during my time away. I'll be in town until Wednesday, so hopefully I will have some fun holiday polishes for you! I love green polishes and Poison Ivy doesn't disappoint. It is a mid-tone green creme that is not too light or not too dark. The formula was slightly thick, but not too bad. As always this one was a little harder to apply since it is a creme. This is one is a keeper though! 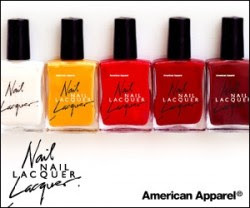 I'm very excited to find out that American Apparel has now launched a polish line. The variety appears to be pretty good and I look forward to trying some of these out! You can order them online on their website, and a press release on them can be found here. They are only $6 and I've heard somewhere that there might be a deal which will get you 3 polishes for $15 (this may or may not be true). I can't wait to find out how they apply! Will you be getting any? Moonlight Magenta is a frosty pink/magenta color that reflects some blue. I loved the application on this-it was really smooth. I don't really mind frosts unlike most people, but this one isn't my favorite BB Couture polish. There's really nothing wrong with it, but it doesn't stand out. Today is Day 3 of BB Couture week! Moonlight Malibu is a very dark blue jelly with loads of microglitter throughout. The glitter in this one looks a lot like what is in Catalina Cutie. Application on this was just fine. Rescue Beauty Lounge Sale Starts Soon! Just a quick reminder that the Rescue Beauty Lounge Sale starts at noon EST and will go until 5 PM. Make sure to add the code VIP 5 HOUR at checkout to receive 50% off. Hurry up and finish that list before it's too late! Today is Catalina Cutie. At first I thought this would be more pink, but this one is definitely a peach color with loads of microglitter. Application was smooth, but needed three thick coats to cover (and it probably could have used one more). Overall, this is a fun polish and I really enjoy it. Welcome to BB Couture Week! I have enjoyed this brand for a long time, so I wanted to show my love by having a week dedicated to their polishes. Up first is Poppy Passion. As I have said many times, reds aren't usually my favorite polishes, but this polish may convert me! It is a red jelly with lots of orange in it. It definitely reminds me of a poppy flower. The application was slightly watery and needed three coats to be opaque. Zoya Renee comes from the La-Di-Da Summer 2009 Zoya collection. It is a bright neon pink creme that had great application and pigmentation. Since it is neon it dried fairly matte (and also dried quickly!) so the picture shows it with topcoat. I really liked this one! Tomorrow I will start a week of BB Couture polishes. I hope you like this brand as much as I do! Parlez vous OPI is a beautiful dusty purple creme. It comes from the OPI La Collection De France from Fall 2008. I think this one is really unique and I don't have anything like this in my collection. I wore this one as a pedi before a mani and I really thought it worked for both. Application and formula was great and was very pigmented. Overall, this one is a keeper! I love this polish! It is such a creamy brown/taupe color from the Essie Fall 2009 Collection. . I'm not usually a big fan of browns or tans, so I was so pleasantly surprised with this one. Application was much better than with Mint Candy Apple and was opaque in 2 coats. Rescue Beauty Lounge is have a sale for 5 hours only on December 15th (Noon to 5 PM EST). All polishes will be 50% off! Make sure to add code VIP 5 Hour at checkout. I hope to get a few of these. What colors will you be getting? I know, this one has been out for awhile, but hopefully you don't mind another picture of it. Essie Mint Candy Apple is definitely not a normal Essie shade. It is an awesome color, albeit not very minty. It is a blue creme with a slight hint of green. At first I thought this one would be more green, but I mostly get blue from it. Application was not great unfortunately. It was pretty thick and hard to control on the nail. Also, it was a little streaky, and needed the full three coats for full coverage. Cruiser comes from the Quirius permanent collection. Unfortunately their site is still not accepting orders due to a system upgrade, but I have a few swatches for when they open back up. :-) When I ordered, they were nice enough to include several extra polishes which included this color. Cruiser is a sky or robin's egg blue creme. As you can see from the picture, the polish looks a bit bluer on the nail than in the bottle. Application was great for a creme. I will be continuing the Musique collection from Color Club with Slow Jam. It is a red shimmer with lots of brown undertones. This very well may be my favorite of the collection. Application was the same as all previous colors in the collection. After Hours also comes from the Musique Collection from Color Club. This one is a smoky grey that has tons of shimmer to it. Sometimes these smoky colors are a little blah to me, but this polish has the right amount of shimmer to make things interesting. As always, I loved the application and they are very pigmented. Feel the Beat comes from the Musique Collection from Color Club (this was released in 2008). I bought this collection at Ross for $7.99! Such a great deal! 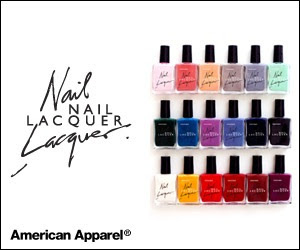 I definitely suggest you check out your local TJ Maxx, Marshall's, or Ross for some good nail polish deals. Feel the Beat is a mix of red and copper. It's one of those colors that is hard to describe. Color Club is one of a few companies that has a handle on their formula. I've never had any major issues with application.